Serve this family favourite with silky avo sauce. 1. Pulse the bread in a food processor until it resembles coarse breadcrumbs. Combine with the mince, onion, carrot, egg, Vegemite, butter, salt and pepper and mix with your hands until well combined. Form into eight thick rissoles and chill in the fridge for 20 minutes. 2. Heat your barbecue to high heat and cook the rissoles for about six minutes, flipping every minute until cooked through. 3. For the avocado sauce, combine all the ingredients except the chilli powder and olive oil in a blender or food processor and blend, adding as much olive oil as necessary to bring it to a smooth sauce the consistency of mayonnaise. Transfer to a bowl and top with a sprinkling of chilli powder. 4. 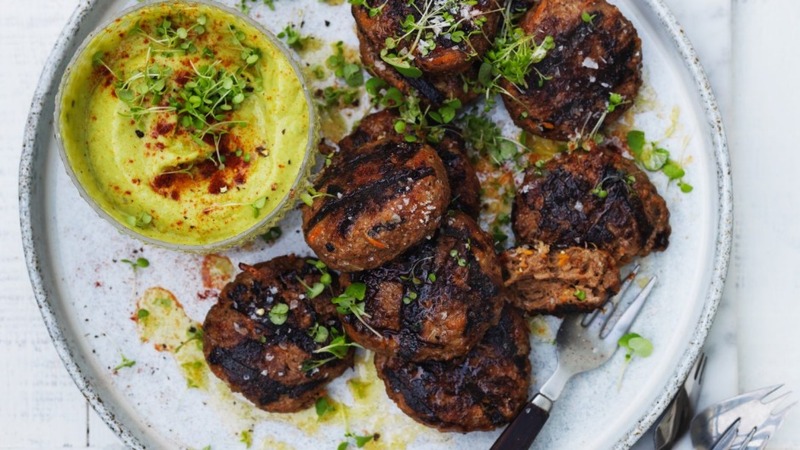 Serve the rissoles together with the avocado sauce.